← Kamandi #43: DC Bicentennial issues continued! Batman Family #6: the debut of the Joker’s Daughter! In 1975 DC launched three comics as companions to Superman Family (which had debuted the year before – an amalgam of the Lois Lane, Jimmy Olsen and Supergirl titles) – all with a “… Family” title. Tarzan Family, Superteam Family and Batman Family. They were “Giant” comics containing mostly reprints for fifty cents, with the lead story (and sometimes a second feature) as a new piece. The debut of Batman Family in October 1975 gave Batman (and it was rare the caped crusader did NOT appear inside the comic – especially in the reprints) five titles; tying with Superman (if you count the Legion comic) six if you count The Joker (and to be fair, if you count Superboy/Legion, you should count Joker). Superman had seven titles (counting Supergirl AND Superboy – I think they do, as they also had the Big Red “S” on the cover…) before the coalescing of three titles into Superman Family. Not counting their appearances in Justice League of America… Superman appeared in Superman, Action Comics, World’s Finest Comics and Superman Family and I would also count Superboy starring the Legion of Superheroes, although that is a stretch. Batman appeared in Batman, Detective Comics, World’s Finest, Brave & Bold and now Batman Family. Not so unusual now, but in the early 1970s out-appearing Superman was quite a feat. Even Spider-Man was only featured in two comics by this time (his third, Peter Parker, the Spectacular Spider-Man, debuted in December of 1976). Also, incredibly to today’s mind, the comic didn’t do well. 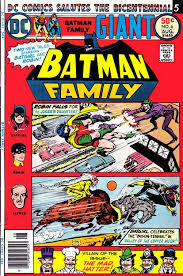 Batman Family lasted only twenty bi-monthly issues until November 1978. It was by that time a Dollar Comic (and one of my favorites) when it “merged” with Detective Comics – another comic that at the time was such a poor seller it also faced cancellation (the mind reels). The Batman Family/Detective Comics dollar-comic merger lasted fifteen issues before reverting back to a single Batman tale plus an occasional back-up feature. This is the most collectible of the 33 Bicentennial issues and the most expensive in the secondary markets. 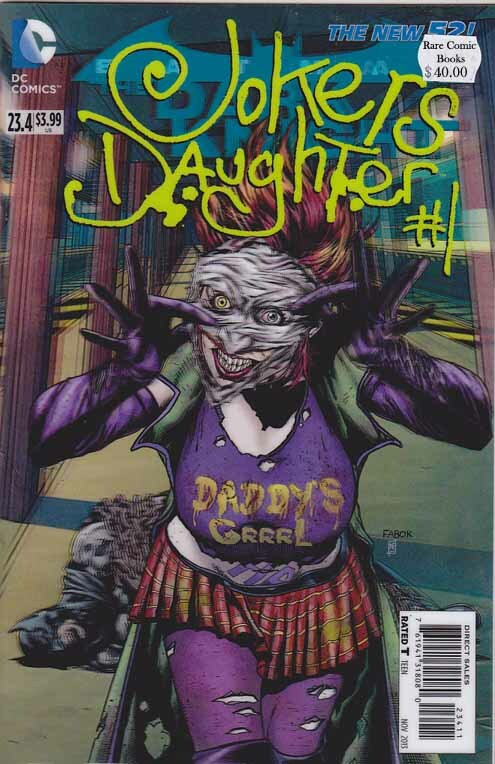 This issue was the debut of The Joker’s Daughter, or Duela Dent, who later changed her identity to Harlequin. 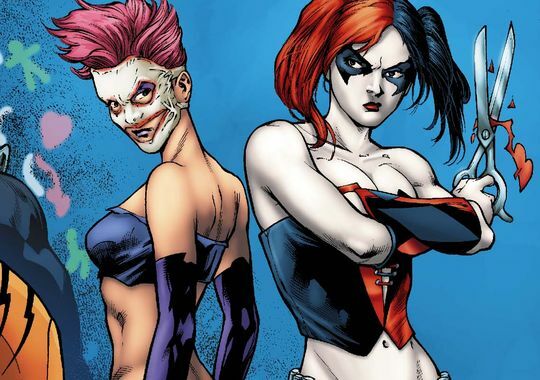 Although not the same character, the idea morphed into the current Harley Quinn. “Valley of the Copper Moon”, Elliot S! Maggin ( w ), José Delbo (a), Vince Colletta (i). Batgirl is guest of honor at this year’s Matituk Indian Reservation’s 2nd Annual Prairie Festival and Indian Rodeo. Congress(wo)man – don’t call her a Congress”man”! – Barbara Gordon (Batgirl’s secret identity) arranges a junket with other Washington officials. They will soon be voting on whether to allow the Abraxas Syndicate to mine the Matituk’s land. Their guide, Jack Lightfoot, is in cahoots with Abraxas (we don’t find this out until the end) and secretly tries to kill Gordon, the single “nay” vote on the junket! “The Joker’s Daughter”, Bob Rozakis ( w ), Irv Novick (a), Frank McLaughlin (i). Mystery novelist Christine Arindae dies. Upon her death a room sealed for 30 years is to be opened per her Last Will and Testament. The room is rumored to contain a manuscript of a novel: a mystery concluding with the death of her greatest character – Ulysses Pylate. The room is unsealed and is found to be empty! 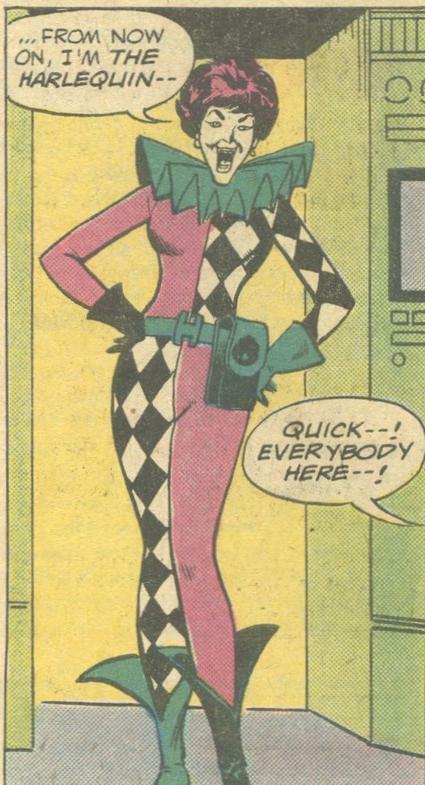 The Joker’s Daughter enters, takes credit for the theft and escapes! She and Robin fight again atop a pedestrian bridge, where Joker’s Daughter admits she did NOT steal the manuscript, although she wanted to! It was Arindae’s last mystery! Joker’s Daughter escapes – vowing to discover Robin’s secret identity! Thieves steal cans of turtle soup from a factory! Alfred, on loan to Bruce Wayne’s friend, walks the dog of his new temporary “master”, suspects the soup company’s competitor and he and the dog lead the police to the competitor’s factory. Alfred claims the dog is part bloodhound and drags a sausage to the factory so it will sniff its way to the factory and affirm Alfred’s hunch. The unbelieving cops follow and Alfred is proved right! But still, everyone believes it was the dog’s nose, not Alfred’s intuition, that solved the crime! “Curious Crime Capers”, Henry Boltinoff ( w )(a). One-page humorous cartoons based on true crimes! Dayton, KY: a prisoner escaped explaining he was claustrophobic and couldn’t stand being locked up! Oklahoma City, OK: a man stole a wrecker – he needed to get a sedan he stole out of a ditch! Dallas, TX: a safecracker is caught red-handed – he’s going on trial the next day and needed some cash! The Mad Hatter escapes from prison and starts a crime spree! Disguised as a fireman, he robs a bank (“gas leak! Keep your money in my fire truck for safe keeping!” Bankers were idiots back then … ); as Robin Hood he steals $10,000.00 in golden arrows, as a chef at a dinner honoring royalty he steals the queen’s diamond tiara; wearing a bowler had, he robs the prize money from a bowling alley (that’s a stretch…). You see, the jurists who convicted him were a fireman, an amateur bowman, a bowling-alley owner, etc. But jurist #5 was a florist, a silk importer and a rabbit breeder … hmm … ah! All those are used by a magician! Sure enough … Mad Hatter disguises himself as a magician to steal diamonds from an exhibit. He tries to get away in a balloon, but Robin pops it with a … hat pin! Letters of comment from Mike White of Mackinaw, IL (positive), Fred Schneider of New York, New York (positive – he enjoyed Robin finally complaining about how cold his skimp costume is…), Scott R. Taylor of Portland, TX (positive), and “reader roundups” – short clips of letters from Jeff Sporn of Bethesda, MD, Mark McIntyre of Atlanta, GA, The Mighty Hackman of Santa Maria, CA and Tom Weyandt of Broadtop City, PA; all mostly asking for Batgirl/Robin solo stories alternating with team-ups.